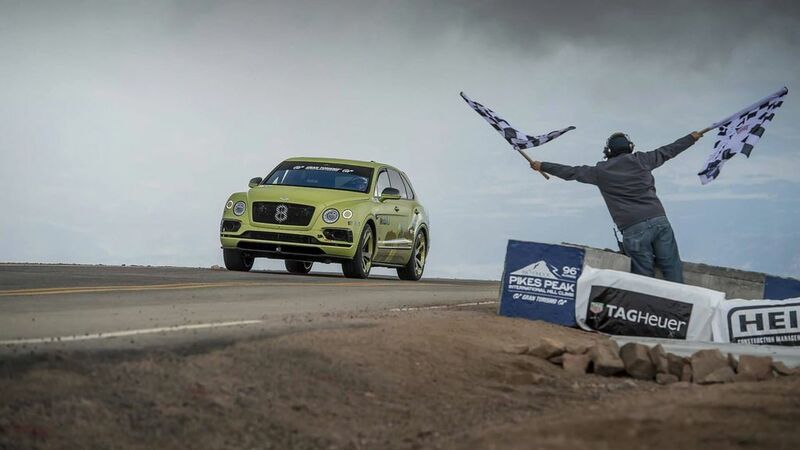 Pikes Peak Hill Climb is one of the toughest racing events in the world as course is just 19.99 kms but it has 156 corners and an elevation change of almost 5000 ft. Paul Dallenback behind the wheel of a Range Rover Sport in 2014 set the record for fastest production SUV at Pikes Peak Hill Climb by finishing the course in 12 minutes and 35.6 seconds. 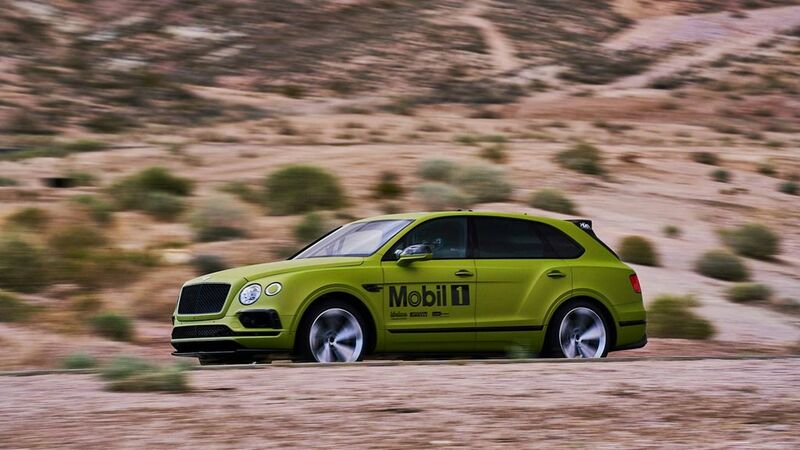 This year, Bentley decided to take on the challenge to beat Range Rover Sport time. 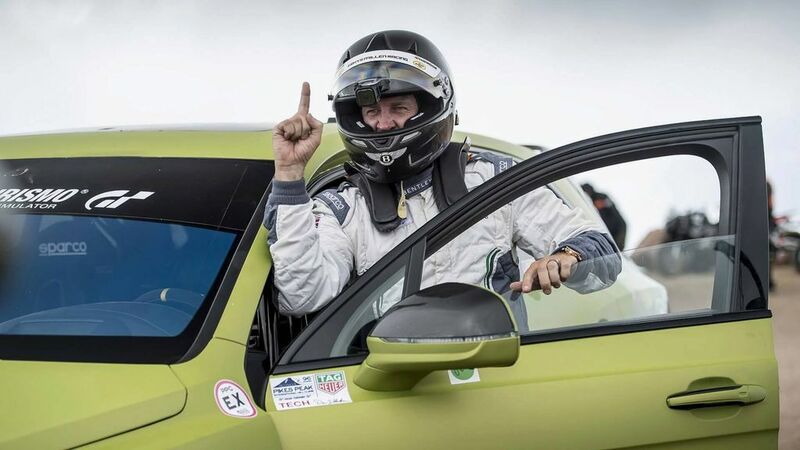 The Bentayga was driven by two time world champion Rhys Millen and Bentley completed the hill climb in just 10 minutes and 49.9 sec which is almost two seconds faster than Range Rover Sport at an average speed of 107 kmph around the course. 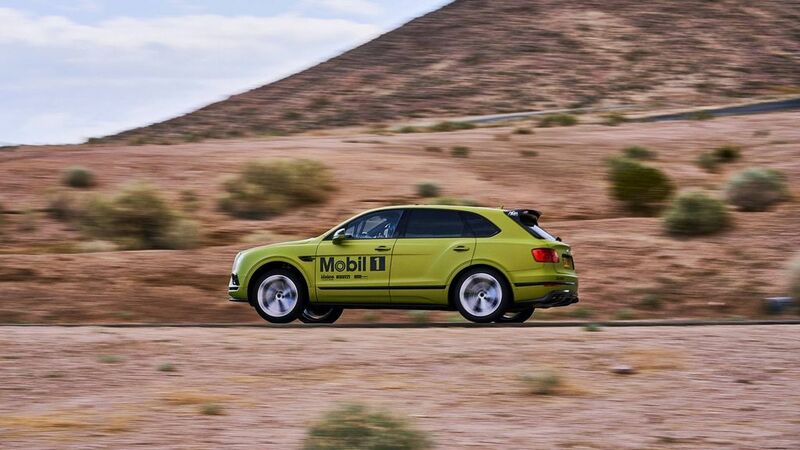 The company had made some changes for stock Bentayga to meet the rules as regular front seats are replaced by racing seats and instead of rear seats a roll cage has been given along with a fire suppression system. 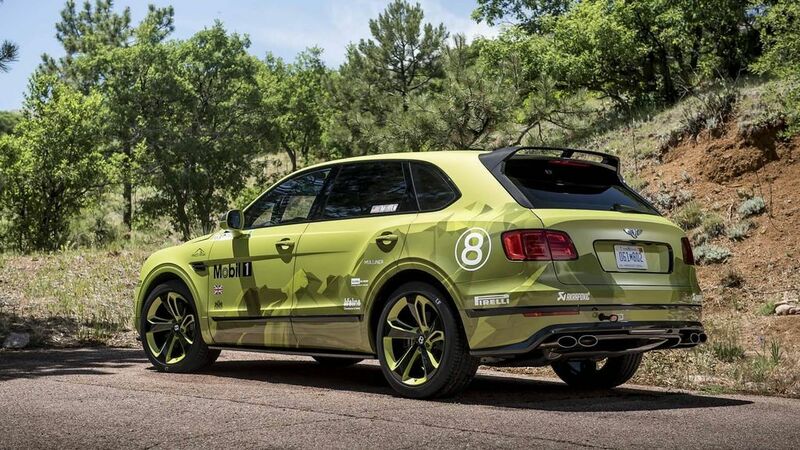 Bentley has also given production spec Akrapovic sports exhaust and the Bentayga rides on performance Pirelli tyres. The suspension, engine and gearbox all remains stock as the company was confident with the performance of Bentayga as it is powered by W12 engine producing 600 hp of power and 900 Nm of torque. The Bentayga comes with adaptive air-suspension along with 48V electric assisted anti-roll bar and carbon ceramic brakes to shed speed easily. 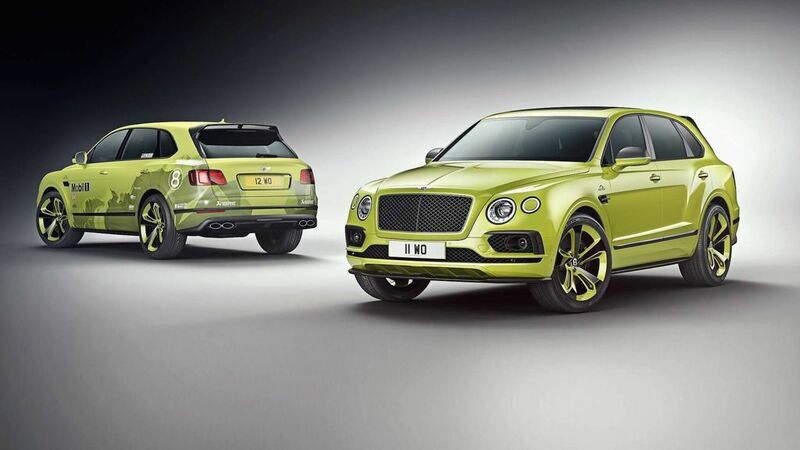 To celebrate the success of new record, Bentley released a special edition model which is limited to just 10 units around the world and it is built by Mullinar which is the bespoke department of Bentley. The special edition model is finished in Deep Beluga Black or Radium colour along with 22 inch alloy wheels and all chrome finishes are replaced by black colour for sporty look. 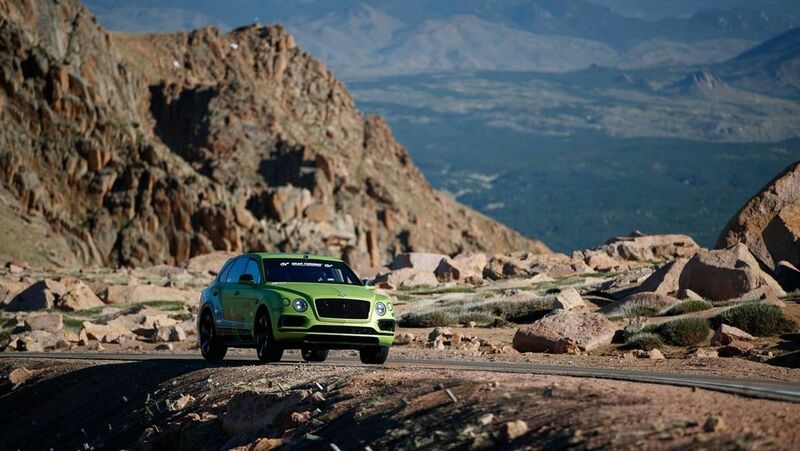 To make it different from other Bentley models, the company has given Pikes Peak logo on front fender. The interior is finished in Beluga leather with Alcantara and Key lime accents. Bentley has also given individually numbered treadplates and a map of the course. The engine is same W12 engine from standard car and the sport exhaust system will be offered. The special edition model booking begins from August and it will be available in US and Europe.